As the healthy lifestyle train continues to pick up speed in Jamaica, the need for healthier meals on the go becomes even more urgent. Diet and nutrition experts like Frances Mahfood, nutritionist at the Heart Foundation of Jamaica, believe that Jamaicans have the unique advantage of access to wholesome unprocessed food like banana and breadfruit to serve this need. Last month , Island Grill became the first quick service restaurant chain to introduce the local foods as a menu option with its launch of Supaah Food. Considered Jamaican super foods, unprocessed local foods such as banana, breadfruit, pumpkin and vegetables such as cabbage and callaloo provide a wide range of nutrients that is integral for health-conscious people on the move. Mrs. Mahfood said natural local foods are also very rich in fibre, a nutrient that many Jamaicans do not eat enough of. "Fibre is essential for bodily functions, for helping with lowering blood pressure, for reducing the risk of heart disease by helping to maintain blood sugar and lowers the LDL or the "bad" cholesterol," Mahfood said. Mrs Mahfood shared that all foods in their natural state provide fibre, pointing out that vegetables are rich in fibre without containing any additional calories. Mrs Mahfood said natural unprocessed foods that are produced in Jamaica are perfect to aid in the fight against diseases. "The more we eat foods that does not go through any processing is the healthier we will be. It supplies our body with nourishment and nutrients that our bodies need to provide nourishment and prevent diseases. Fruits and vegetables are your daily multi vitamins so why not have them in wholesome foods? It is what the body wants, it doesn't want pills." Island Grill's Supaah Food consists of locally grown breadfruit, banana, corn, pumpkin with callaloo or cabbage. 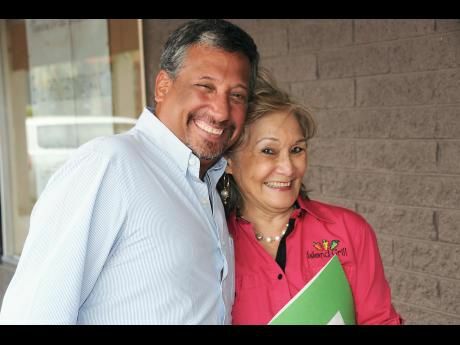 Mrs Mahfood said Island Grill made a step in the right direction by, not only promoting healthy foods and making it accessible to the public, but promoting local foods and leading the education process about the nutritional value of the locally grown foods. "All the foods in that meal support heart health, they have something to contribute to heart health because they are not processed. Eating wholesome supports heart health," Mahfood added. Corn, which is high in fibre, is a resistant starch which means that the starch passes through the digestive tract unchanged and functions like a soluble fibre. Many studies in humans show that resistant starch can have powerful health benefits including improved insulin sensitivity, lower blood sugar levels, reduced appetite and various benefits for digestion. "Pumpkin is also high in fibre, high in potassium and vitamin C. A diet high in potassium can lessen the effects of sodium which helps to control blood pressure. Pumpkin is a great vegetable to add to the diet. It also has beta carotene which is the precursor to Vitamin A and is good for eyesight," Mahfood added. Breadfruit, which is another feature in Island Grill's new menu offerings, is a common local starch food, which Mahfood said is a wholesome and organic source of energy for the body. Supaah Food, anyone? 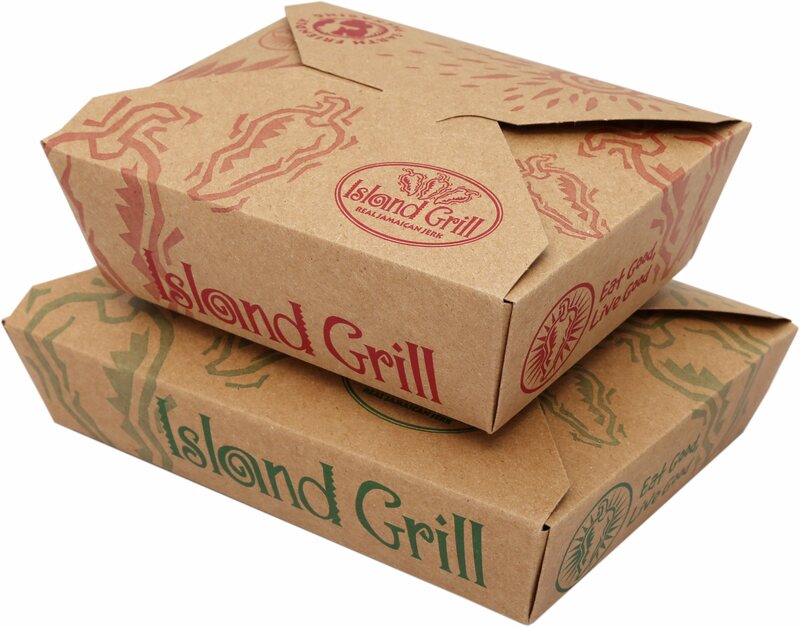 Well, Island Grill has you covered by satisfying your appetite one healthy and hearty bite at a time. The local food chain launched its Supaah Foods menu at their Manor Park location on Wednesday to the delight of sponsors and specially invited guests. If you don't know what Supaah Food is, picture eating a natural rainbow green callaloo, orange pumpkin, blush-yellow breadfruit or sunshine-yellow corn - to be indulged with your choice of Island Grill's traditional jerked, barbecued, curried or fricassee chicken or veggie stew. Greeted by beautiful produce on the outside of the restaurant, courtesy of the local farmers on board, guests received a warm welcome from staff before making their way into the venue. Expanding their mantra, 'Eat Good, Live Good', Howard Mitchell, chairman of Island Grill, explained that Jamaica is covered with popular superfoods that the world is excited about, "We need to eat locally and think globally," he added. He introduced the minister of health, Dr Christopher Tufton, who highlighted that Island Grill is the food chain of choice for his family. He noted that he has seen the company's evolution, promoting healthy living, and commended them for providing healthy options for Jamaica. He noted that the biggest issues facing Jamaicans are unhealthy food choices and physical inactivity. 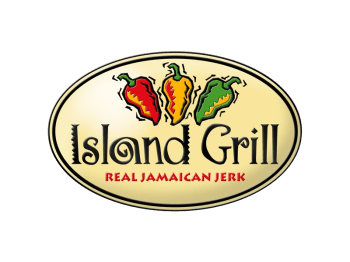 Island Grill's tasty initiative, he said, is the perfect fit for the country's Jamaica Moves campaign. "It looks good, it feels good it smells good, so I'm just waiting on the taste," he declared of the Supaah Food options. Farmers Llewellyn Grant and Andrew Warwar also took to the stage to share their appreciation for being a major part of the Island Grill family. The lovely and vivacious CEO, Thalia Lyn, closed the formal proceedings by thanking everyone - from the minister of health to her local farmers, to her Best Dressed and CB Chicken family, board chairman, directors, family members, bloggers and foodies - for making this new venture possible. Salivating at the sound of chopping during Lyn's speech, many were eager to savour the flavour of the Supaah Food for themselves. So what are you waiting for? Try Island Grill's Supaah Food today! Pursuing its health-conscious mandate, quick-service chain Island Grill has upped the nutrition quotient with a revitalised menu that now offers more ground provisions and produce under an in-house Supaah Food banner. 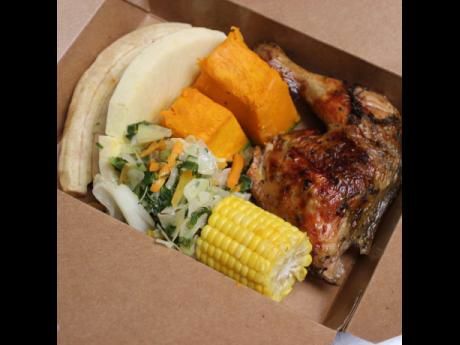 Existing combos such as the Yabba and Satisfaction combo range will be infused with this fresh undertaking by the Thalia Lyn-founded establishment featuring a new seven-piece medley of breadfruit, sweet corn, green bananas, pumpkin and steamed vegetables of callaloo or cabbage, made available to diners as of yesterday. At the Manor Park branch of the franchise, chair Howard Mitchell introduced the chain's new endeavour to a gathering of food and beverage industry types, farmers and the media. “Consuming a Supaah Food meal is a conscious choice for a better you and a better Jamaica. In this time and age, no matter where you are in the world, citizens are more informed by the impact of the choices businesses make,” said Mitchell as he kick-started the menu launch yesterday. The health minister Dr Christopher Tufton offered his own endorsement of Island Grill's 'good sustenance and healthy living' modifications with an address that underscored his approval and highlighted the “innovative entrepreneurship and a responsiveness” to Island Grill's customer base as well as the parallels to his “agenda to promote public health”. This comes on the heels of Tufton's recent Jamaica Moves healthy lifestyle initiative, which has gained traction with Corporate Jamaica, and unsurpisingly the Real Jamaican Jerk eatery has signed on as a corporate challenge partner in this governmental response to reducing non-communicable diseases — think: diabetes, hypertension, and certain cancers — through the encouragement of increased physical activity and more thoughtful eating among the Rock's populace. 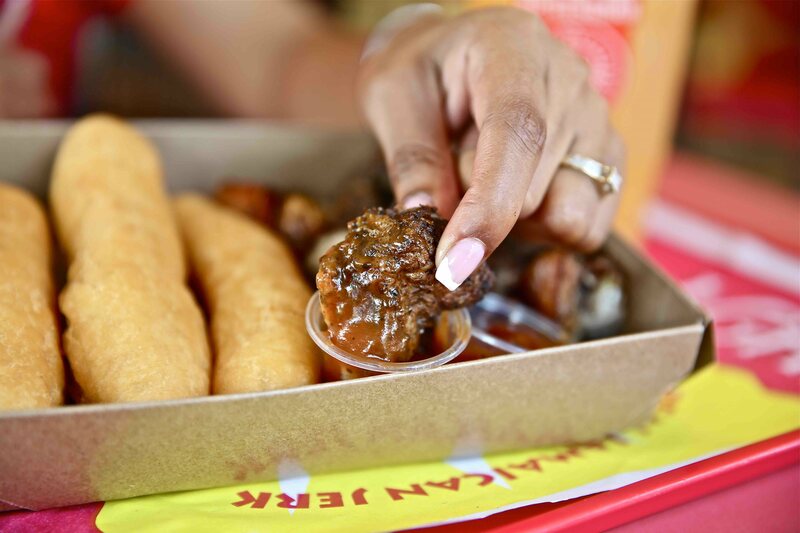 Widely perceived as the healthiest quick service restaurant (QSR) chain in Jamaica, Island Grill has taken their philosophy a step further, with the launch of their “Supaah Food” menu. The menu consists of locally grown foods that are considered super foods based on their nutritional value — in line with the country’s mandate to encourage Jamaicans to eat local and healthier. Founder and CEO of Island Grill, Thalia Lyn said the new menu is a response to customers’ requests to have more locally grown, wholesome, healthy foods and ground provisions as part of their lunch offerings. “Supaah Food is a natural extension to Island Grill’s philosophy of “Eat Good, Live Good,” which is an idea that has always dominated our kitchens, as almost all our meals are prepared from scratch everyday, using fresh ingredients only,” Lyn stated. The Supaah Food menu will contain a choice of callaloo or cabbage which are rich in iron and fibre among other essential vitamins, breadfruit which contains potassium and Omega 3 and 6, pumpkin which is full of beta carotene and Vitamin C, and both green banana and corn which are excellent sources of energy with their high Vitamin B6 content. “We also ensured that the Supaah Food menu is in keeping with recent healthy trends, so it is gluten free with the exception of the Supaah Food Yabba Veggie Stew which contains wheat. 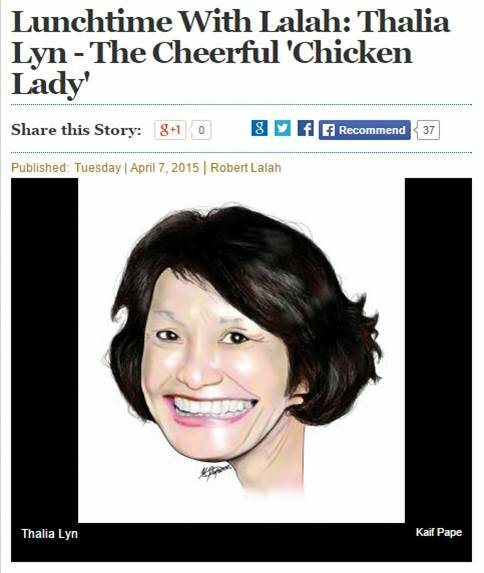 It also does not contain any artificial flavouring or preservatives,” Lyn states. 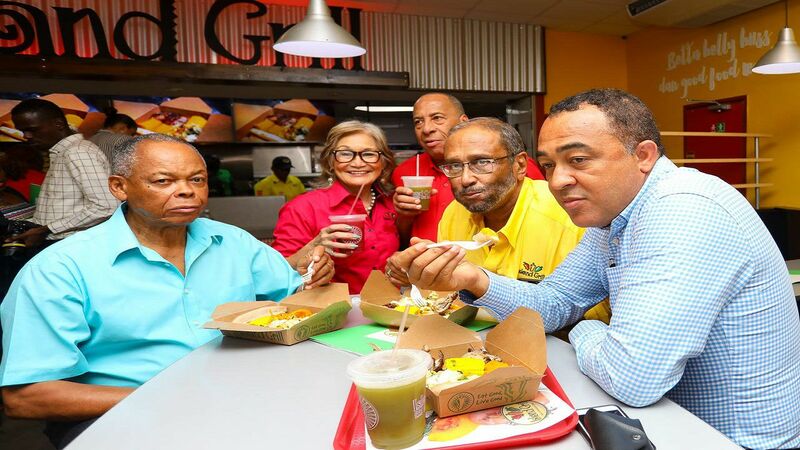 Island Grill’s move to introduce the Supaah Food range comes on the heels of the Ministry of Health’s Jamaica Moves campaign, and the establishment of the National Food Industry Task Force, which is in keeping with the direction of the country towards a healthier lifestyle. The Supaah Food meals can be paired with either jerked or barbecued chicken, veggie stew, curry or fricassee chicken as well as Island Grill’s very first vegan offering — “Jus Food”, which is 100 per cent plant-based. Supaah Food became available across all Island Grill stores yesterday. 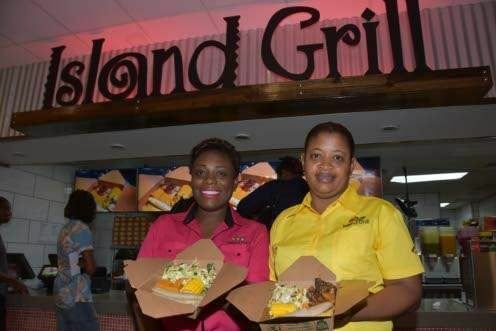 Local quick-service restaurant chain Island Grill has introduced its ‘Supaah Food’ menu, comprising locally grown foods with good nutritional value, in a bid to encourage Jamaicans to eat local and healthier. 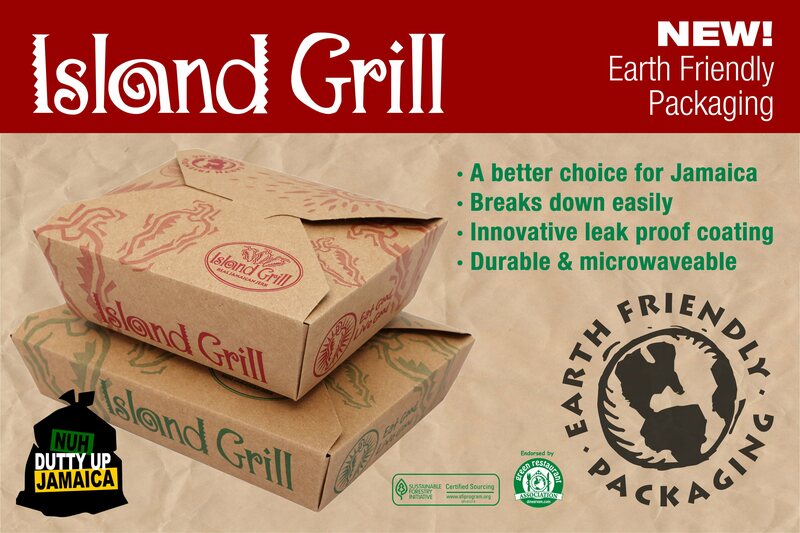 Island Grill CEO Thalia Lyn said the menu is in response to customers’ requests to have more locally grown, wholesome, healthy foods with ground provisions as part of their lunch offerings. “Supaah Food is a natural extension to Island Grill’s philosophy of ‘eat good, live good’, which is an idea that has always dominated out kitchens as almost all our meals are prepared from scratch everyday, using fresh ingredients only,” Lyn said. The Supaah Food menu contains a choice of callaloo or cabbage, which are rich in iron and fibre among other essential vitamins; breadfruit which contains potassium and omega 3 and 6; pumpkin that us full of beta carotene and Vitamin C along with green banana and corn, which are excellent sources of energy. “We also ensured that Supaah Food menu is in keeping with recent healthy trends and so it is gluten free with the exception of the Supaah Food Yabba Veggie Stew which contains wheat. It also does not contain any monosodium glutamate (MSG), artificial flavouring or preservatives,” Lyn said. 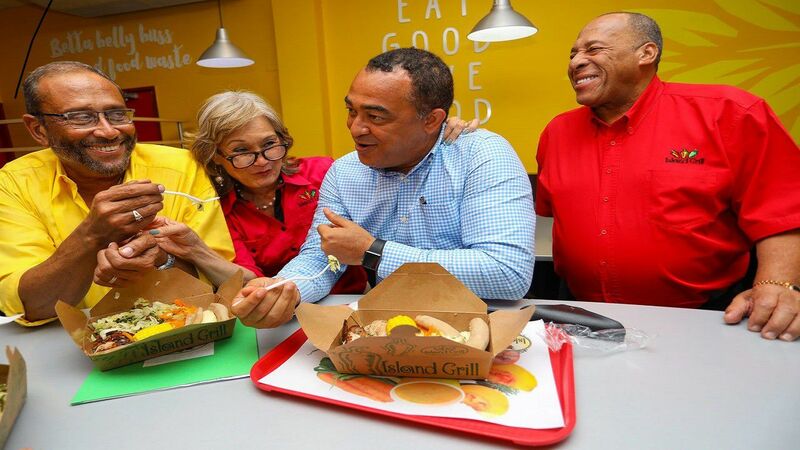 Health Minister Chris Tufton commended Island Grill for integrating more locally grown, healthy foods to their menu, including complex carbohydrates, which are important to human sustenance and the general health profile of people. 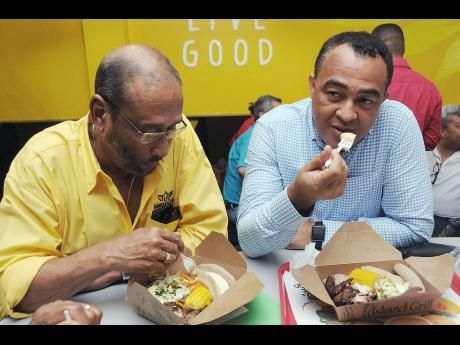 “We are seeing a genuine effort to prodive Jamaicans with additional, healthy options,” Tufton said, noting that proper nutrition will complement the government’s Jamaica Moves initiative. Carifta Swim team member Leanne McMaster in a picture perfect dive phase during her training session at the National Aquatics Centre on Monday.